While the impact of 3D printing has often been more prominent in a manufacturing setting, its real-world benefits also greatly impact health care. From custom prosthetics to skin for burn victims, 3D printing is helping make what once seemed impossible a reality, as well as reducing costs and producing less inexpensive complex parts. Recently, a team of doctors at Children’s Healthcare of Atlanta, Ga., used this revolutionizing technology for a 7-month-old patient. The team completed the first such procedure in the state by placing three custom 3D-printed tracheal splints—created by biomedical engineers at the Georgia Institute of Technology—in the infant, who battles life-threatening congenital heart disease and tracheo-bronchomalacia. The surgery took 10 hours to complete. The infant had been hospitalized for six months and was experiencing repeated airway collapses, which current surgery methods could not fix. 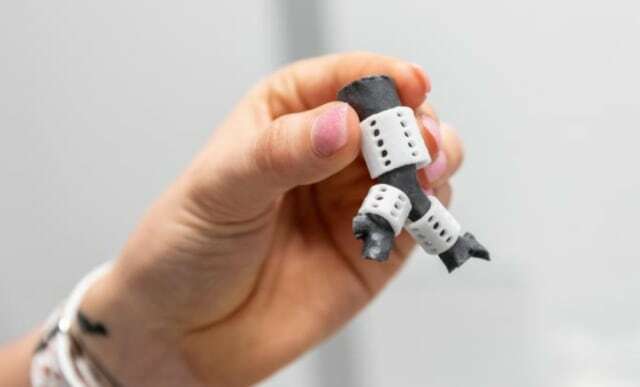 Although the 3D-printed splints are new and still under development, the doctors were able to obtain emergency clearance from the U.S. FDA to move forward with the procedure. The splints will work to expand the child’s trachea and bronchus. Within a few years, they will be absorbed into the patient’s body. Although this was a first in Georgia, it was the 15th time a pediatric patient has received 3D-printed tracheal splints. Scott Hollister, Ph.D., developed the process while at the University of Michigan. He now holds the Patsy and Alan Dorris Endowed Chair in Pediatric Technology, a joint initiative supported by Georgia Tech and Children’s Healthcare of Atlanta. To begin the procedure, the Georgia Tech team worked with a CT scan of the patient’s airway to design and create precise splints for the surgical team. Once the 3D model is designed, the 3D printer uses polycaprolactone (PCL) powder followed by laser tracing the pattern to fuse the particles. Hollister and his team of biomedical engineers worked with the Global Center for Medical Innovation (GCMI) to create several versions of the splint in different sizes. This helped ensure that the team of doctors had the perfect fit available during the procedure. Interested in more medical innovations using 3D printing? Check out Prototype 3D Printed Implant Might Help Restore Some Spinal Function and 3D Printing a Bionic Eye.